Using the Arduino board to monitor the solar and wind system. As I looked over the software required for the ScadaPack 100, my original choice for monitoring the system, I reconsidered my original choice as it was clear that while I was familiar with it, the majority of non technical people would not be. It required using a MODBUS interface to talk to it and to get data out of it. While it is a self contained system with a DIN rail mounting configuration, the downside of using ladder logic and MODBUS was a clear detriment. The Arduino has six (6) analogue inputs (5 vdc maximum input voltage) that can read voltage from the battery, solar and wind system. All that is required is to scale the voltage inputs, using simple resistor voltage dividers, to keep it below 5 VDC so I do not blow it up. It can also replace the low voltage detect board which eliminates one piece of hardware and will be able to control the solid state relay for the AC charger. 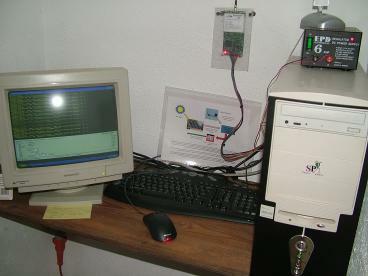 The performance data will be sent, via a zigbee radio system, to the office computer as a CSV file (comma separated values) that can be imported into Excel for graphing. The zigbee modules are plug and play with the Arduino board so replicating my system should not prove difficult. The Arduino board also has digital inputs and outputs that can be used to trigger solid state relays that will control the grid chargers. The software is easily understood and there are sufficient libraries of existing code that will make writing the program less difficult than it would have been had I used the ScadaPack 100. The documentation on the Arduino board is first rate and does an excellent job of working the novice through the process of making something useful out of the board. I looked at numerous examples of code and used a good bit of it to get me started. Once I understood how the Arduino functioned, it was not difficult to develop the code. I will also add that I have not had any real experience with either C or C++ code so this was a ground zero start. Now having said that I want to encourage anyone, even those with no programming experience, to seriously consider the Arduino as the heart of a control and monitoring system. Everything I have tried with it just plain works. I purchased the zigbee radio interface and it worked. Well there were a few cockpit problems that not being stupid would have prevented, but once I understood the interface, it just worked.